Hookpad Songwriting Software - Write The Song You Always Wished You Could. Write chords and melody like a boss. Hookpad is a chord progression and melody sketchpad with built-in music theory, melody guides, and intelligent chord suggestions to help you write chords and melody like a boss. It’s everything you need in one place to quickly and easily sketch out and explore musical ideas. 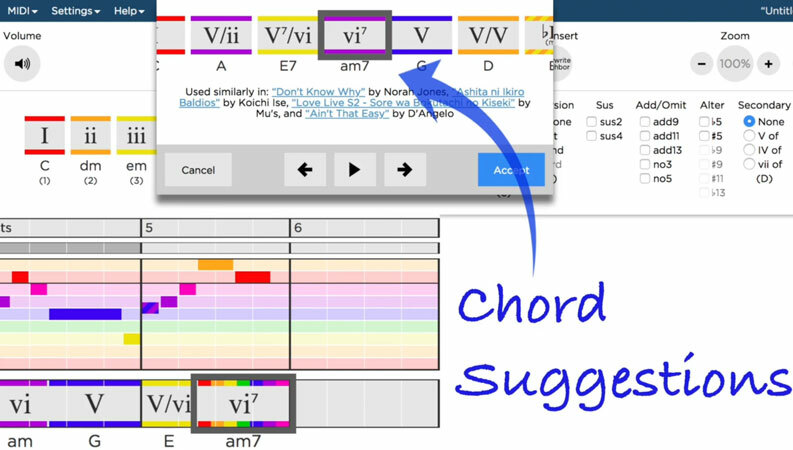 Hookpad helps you write good chord progressions. Picking the right chords for a song can be tough. There are so many to choose from and often only a select few sound good in any given scenario. 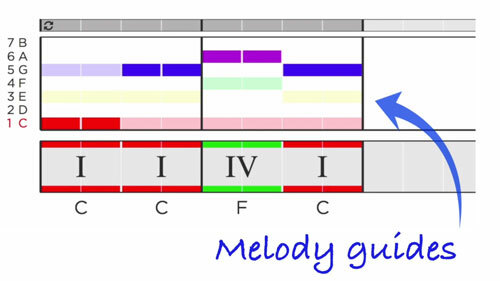 Hookpad's chord palette groups the chords that work well together in a particular key. With just a couple clicks, you can build a great chord progression. Sometimes knowing what notes to use in the melody can be the hardest part. Once you've chosen some chords, Hookpad can help you pick notes for your melody by highlighting the notes that are in the chords you've written. That way you can see immediately which notes will sound more stable (the colored notes, as shown below) and which notes will create a more dissonant sound (the white notes). Use the stable notes as a guide when you are picking notes for the melody. 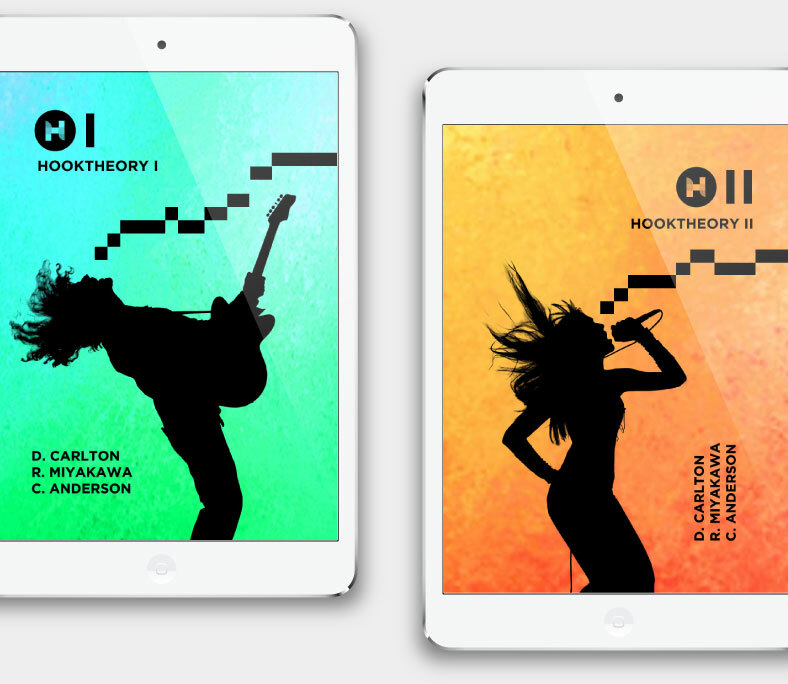 Hooktheory’s Music Theory For Songwriting Book Series covers this topic in great detail. Want an EDM bass? A metal guitar? A violin section? No prob. Hookpad chords and melody know how to play themselves on dozens of instruments in many popular styles - so you don’t have to think about it. Simply choose a new instrument and you’re done! Watch the video to hear Hookpad’s diverse simple library in action. Video demonstrating several of Hookpad’s instruments and band templates. Easily create MIDI chord progressions, MIDI bass lines, MIDI melodies and MIDI drum tracks. Transform your production workflow by using Hookpad to create MIDI tracks for Logic Pro, Ableton Live, Pro Tools, FL Studio, etc. With intelligent harmony / chord fills, and the ability to independently shift the tonal center of each track, incorporating Hookpad into your workflow will enhance your creativity and productivity as a songwriter or producer. Video demonstrating 3 ways to use Hookpad’s MIDI dran-n-drop feature. Export to sheet music, lead sheet or guitar tab. Hookpad’s simple interface means you can write out a chord progression and a melody in minutes. 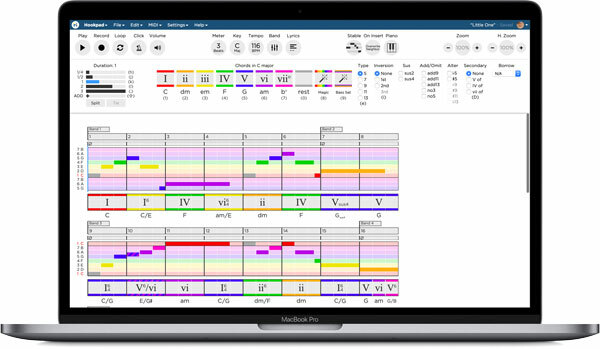 With instant exporting to sheet music, lead sheet, and guitar tab, Hookpad is one of the fastest way to create a score, lead sheet, or guitar tab for a chord progression and melody. Sample score. Sample guitar tab. If you get stuck writing chords, Hookpad can help. Hookpad can help you pick the right chords with Magic Chord. Magic Chord lets you ask Hookpad what it thinks is the best chord to use in a given situation. Hookpad will analyze the chords you’ve already written and then look for examples of songs in the Theory Tab Library that have used chords similarly to get clues as to what chord might work best next. Then it provides suggestions for you to pick from. Find the right chord in any situation! If you are not 100% satisfied with Hookpad, you can reply to your email receipt to receive a full refund. 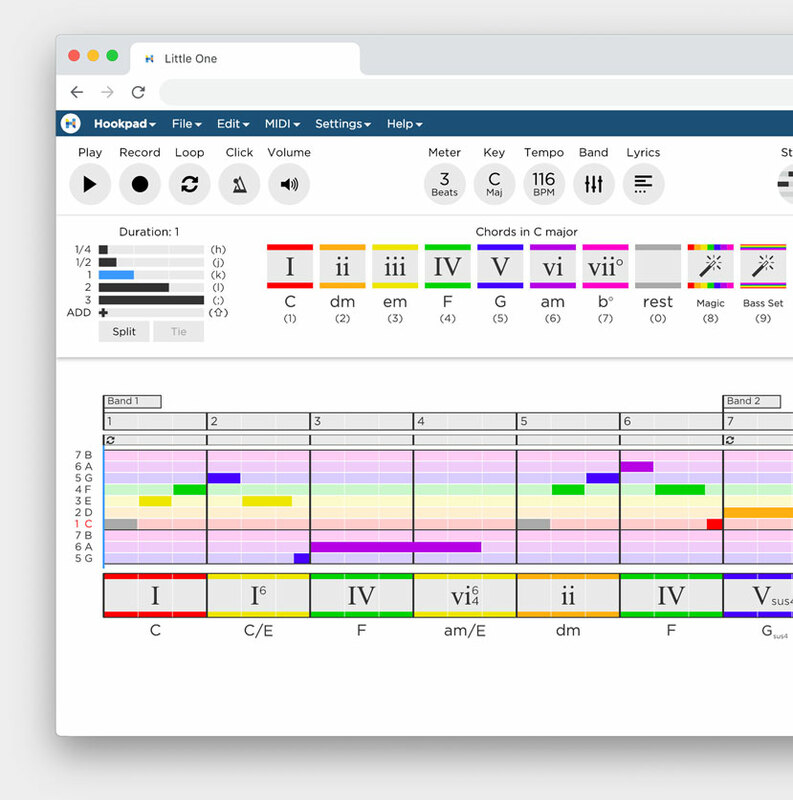 This intelligent musical sketchpad will help you write amazing melodies and chord progressions, even if you're not a pro. Its everything you need in one place to quickly and easily make great music or experiment, sketch out, and explore musical ideas. Write great chord progressions and melodies in minutes, even if you’re not a pro. Save time and the frustration of editing MIDI notes in your DAW. Let Hookpad do the work for you. 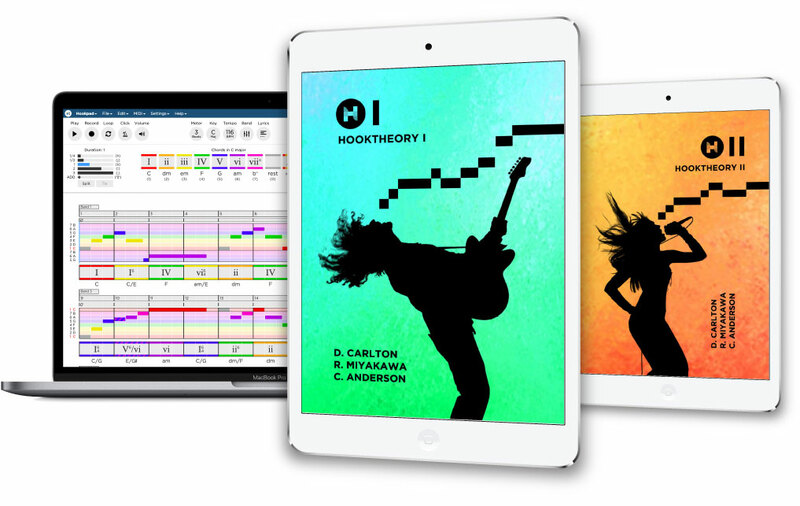 Includes Hookpad, the intelligent musical sketchpad will help you write amazing melodies and chord progressions, and the skill-building companion Hooktheory Book Series, that teaches you how to craft melodies and chord progressions like professional musicians and gives you a deeper understanding and intuition for how music works.